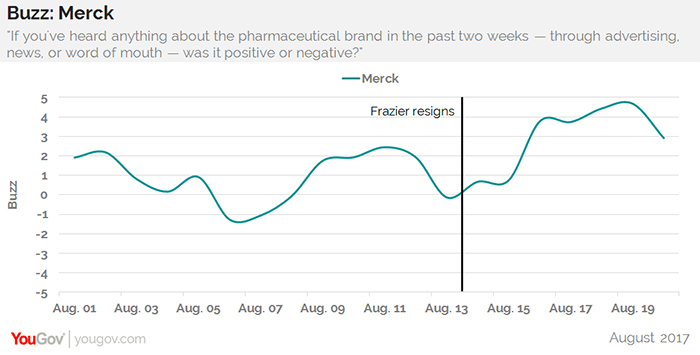 Pharmaceutical giant Merck received a notable bump up in consumer perception after CEO Kenneth Frazier announced he was quitting President Trump’s manufacturing council, according to YouGov BrandIndex. Frazier’s resignation, in which he stated he felt “a responsibility to take a stand against intolerance and extremism,” was done in response to President Trump’s handling of white supremacists and neo-Nazis in Charlottesville, VA.
From August 15th, the day after Frazier’s resignation, through Saturday, August 19th, Merck’s perception took a notable climb up before subsiding. 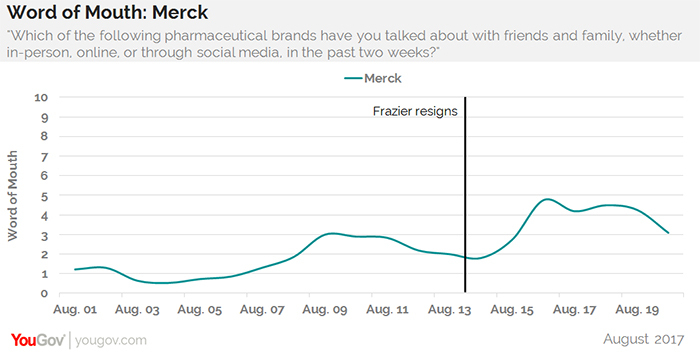 Word of mouth about the Merck brand also swiftly rose within the same time frame, from 2% of U.S. adults having spoken about the drug brand with family or friends, to 5%. YouGov BrandIndex measured consumer perception with its Buzz score, which asks respondents, "If you've heard anything about the pharmaceutical brand in the past two weeks — through advertising, news, or word of mouth — was it positive or negative?" and Word of Mouth score, which asks respondents, "Which of the following pharmaceutical brands have you talked about with friends and family, whether in-person, online, or through social media, in the past two weeks?"